In this project we will design and build a DC Voltage Calibrator, providing a voltage range from 0 to 10 volts in 1 milli volt steps. The user interface will be a TFT display with touchscreen. In part 2 of this project we will make a number of improvements and build the unit in to a project case and carry out some tests. This a great project that I intend to take advatage of. As an enhancement to assist with the calibration of the higher voltage ranges, could a further stage, perhaps utilizing a high voltage op amp (and of course, a suitable power source) be added to take the voltage up to about 100 volts? Do you have plans to get any more pcbs (for the DC Voltage Calibrator)? I will have a small quantity of the DC Calibrator PCB’s next week. I’d like to order the PCB’s Please let me know the cost incl shipping to usa. I’d like to order the pcb’s. Please let me know if you have any available. Louis, I only discovered your youtube channel in the past week, but was extreemly impressed with the DC load and DC voltage calabrator. I see that you offered boards for the voltage calabrator at one point and was wondering if you still had any available? I haven’t finished the DC load videos yet, so im not sure if you made any boards for that one, but if you did I would be interested in that as well. I will send you an email with regards the PCB’s for both the DC Calibrator and DC Load projects. I would also like to get a PCB if you still have any. I have assembled your DC calibrator as it works very fine, great project. But i have tested two similar display, one have a touch chip XPT2046 and works fine, another have a HR2046 chip, and touch don’t work! I discovered that the touch works but x and y position are reversed, as the image were upside down. I have to change some settings in yours sketch? Yes I have found some TFT display sold on eBay have the touch screen element in reverse. Which is the max value for reference input? Watching the video on voltage setting I thought the use of the touch screen was a bit fiddly in operation. Would it not be better to use a rotary encoder? While the touchscreen method does avoid accidental changes to the output setting – which could be possible when using a continuously variable control, it would not be disastrous imo – though it might if calibrating an analogue meter depending on the range setting. What do you think about this idea as a possibility? Or, alternatively, if sticking with the touch screen, use up and down arrows on the screen to increase or lower the output voltage. Either of my suggestions would probably require the step resolution to be increased as it takes some time to scroll up or down in 1mV, 2mV or 4mV steps. Who requires anything better than 100mV steps? pcb’s required for this project. I live in the States so, let me know the overall cost + shipping to Calif (Zip 95678). I am interested in getting a set of the pcb’s required for the project. I live in the States (Zip 21032). I’ve been having a youtube marathon watching your projects after discovering your channel. Absolutely fantastic content. 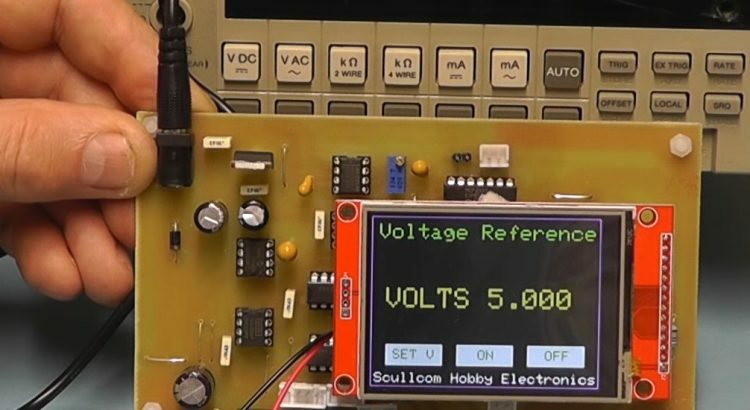 Do you still have any PCB’s for the DC Load Project and this (DC Voltage Source)? I’m located in the UK. I do have a few spare DC Load PCB’s left. They are version 9.3 which include some improvements. I will send you and email with details. I’m trying to contact you regarding The Worcestershire Regiment. Its an amazing source of history and it has helped me very much already. I know this is not what your Scullcom website is about but there didn’t seem to be a way or emailing you from The Worcestershire Regiment site. I’m wondering if you could assist me in finding people who I could contact, who might be able to help me? I’m a 3rd year historical stone carving student at the City & Guilds School of Art, and my main aim for my final year is the creation of a sculpture that is a development on Charles Sargeant Jagger’s work on the Royal Artillery Memorial On Hyde Park Corner. Charles Sargeant Jagger a former soldier of the 2nd Worcestershire Regiment in 1914 who was indeed injured 3 times and received the Military Cross. I’m particularly looking for possible patronage that would help me to purchase the stone required but also a suitable place that my finished piece could be placed and perhaps given as a memorial to The Worcestershire Regiment in what is the 100th year since the end of World War 1? I would be so very grateful for any help at all, as I’m finding it very difficult to find any contacts. I would like to purchase a set of PCBs please. I’m interested in getting a set of boards for both the DC Load and the DC Calibrator. Any chance you’d consider making an AC Calibrator? Hi Louis do happen to have any of the main boards for the DC Voltage calibrator, for sale I could do with one, my original got destroyed when a tantalum exploded,to much damage to make an effective repair ,I tried but no go now, if you have I’d willingly pay, I used it a lot, I wished I used better quality tantalum’s, lesson learned. And we are missing you. Hi If Louis can’t help you there’s a guy selling them on Ebay, £7 for the pair and free postage. Ebay item number 283354831597. Got myself a set the other day! Thank You Mark, Louis is a busy man, so it would save him the aggravation, I found it a really useful device. Hi Mark my boards arrived today, thank you for your help, this will be the second calibrator I’ve built, better quality components is the order of the day, and this one will also get the ultra sonic cleaner bath. Hi Paul, I’m glad that your boards arrived safely. I have all the parts to build mine. At the moment I’m working on the battery module, all going well. How is the accuracy of your unit? Louis did mention software calibration to improve the accuracy of the unit. I hope there could be an update on this project. Hi Louis hope that you are well? Will there be any upgrades of software or hardware to the DC Calibrator project? As someone who would like to own the HP6920 meter calibrator I was attracted to you voltage calibrator project. There is a real need for a modern version of this machine. One of my feasability investigations in the past was into using a class D amplifier to design such a beast. Whilst at the calibration lab I worked on many calibrators some were unstable the HP6920 was much in demand for field calibration. Some calibrator capability can be had by using HP Vee or nat instruments software to control a power supply being monitored by a DVM on the same instrument bus. However not the same as the old Harrison meter calibrator. Hi What is the maximum voltage input that you can use? I have a 18v drill charger that reads about 22v off load would this be permissable I doubt that this supply is regulated?? when building the battery module, Has anyone had any problems with faulty DC-DC converters? I’m haveing problems rechecked wiring connections upteen times still no joy. Solved used a DC socket I had here and it was not the correct one ordered the correct one in Louis’s part list – All Good! Hi Does anyone know how to adjust the calibration in the arduino software? This is very good project with expansion possibilities. thanks for all your hard work. if boards are available please let me know. should be able to get with your gerber files if not. hope you are well and hope you will again return to you tube.